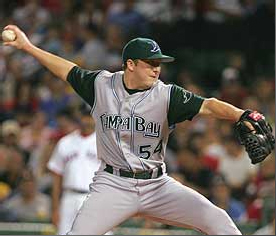 Chad Orvella was recently sent to AAA Durham after 10 appearances with the Tampa Bay Devil Rays. In only his 4th full season as a pro, Orvella has spent parts of each of the last three seasons with the Devil Rays, but has yet to achieve the same level of success he has experienced at the minor league level. In 169 innings as a minor leaguer, Orvella has a 1.49 ERA and has recorded 241 strikeouts and only 33 walks which equate to 12.8 K/9 and 7.3 K:BB. Those numbers are incredible at any level. Still, Orvella has struggled at the major league level. In 82.1 innings he has an ERA of 5.79 and has only recorded 66 strikeouts with 53 walks. His rates at the major league level have dropped to 7.2 K/9 and 1.2 K:BB. Since being back in Durham, he is back to his dominating ways, with 5 strikeouts and no walks in 3 appearances (3 ip). He has allowed only 1 hit. 1. You were used sparingly as a pitcher at NC State. When did you first realize that your best chance of making it to the majors was as a pitcher and were you surprised that the Devil Rays drafted you with the intent of making you a full-time pitcher? CO: When I went to the cape cod league I hit about .180 and realized I should probably get on the hill and scouts saw that I had a good arm and asked me to throw at a practice at NC State. 2. In only your fourth season as a full-time pitcher, you are still very early in your development. Explain how you work on your mechanics. Do you watch video of yourself or do you rely exclusively on the advice of the coaching staff? CO: I’ve just started to watch video. It’s tough to work with a coaching staff because I’ve had so many different pitching coaches over the past four seasons. The one that’s seen me the most is Xavier Hernandez (Bulls current pitching coach) so if he has any advice I’ll listen to him. 3. This season you have worked with both Jim Hickey and Xavier Hernandez. How do their coaching styles differ? How are they similar? CO: I think both of their styles are to be aggressive and be the aggressor as the pitcher. I haven’t really been able to work with Hickey too much but he seems like a good buy. 4. For a young pitcher that has bounced back and forth between the minors and the majors and from pitching coach to pitching coach, how do you adjust to the different environments and the many voices offering advice? How much do you lean on others besides your current pitching coach (other pitchers, catchers, former coaches, etc.)? CO: You try to take a little advice from everybody and make it your own. Use what you can. Everybody has an opinion. 5. Dioner Navarro and Shawn Riggans are both talented catchers, but both are young. How important is it to a young pitcher and a young pitching staff to have a veteran like Josh Paul, in Tampa, or Raul Casanova earlier this season and Michel Hernandez now in Durham? CO: I think it’s important because they may know some of the big league hitters, but having a catcher like Shawn Riggans, where he’s seen me throw for four years, I think is more important than having a veteran catcher that doesn’t know you at all. 6. After your most recent demotion, you once again were back to dominating hitters. It was reported that you discovered a flaw in the mechanics. If that was the case, what was the flaw and how was it discovered? CO: Jamie Shields brought up an idea that my delivery has changed in the past couple years. A few years ago I used to squat down really low, in fact, the guys used to make fun of me because it looked like I was sitting in a chair. But I’ve gotten away from that and now my command has gotten worse. I’ve gone back to looking like I was crouching in a chair and it seems to be working. 7. When you do tweak your mechanics, how is the adjustment? Is it something that you are comfortable with and notice the improvement immediately or does it take getting used to? CO: When I made this adjustment it was pretty quick. It’s just getting comfortable with it again. The biggest difference I see is in my off-speed stuff and how the hitters are reacting to that. 8. Have the Devil Rays indicated to you what you need to improve in order to be more consistent at the Major League level? CO: They’ve just said that I need to be more consistent. I’ve always had a lot of success at Triple-A and throughout the minor leagues. They know I’ll do well here, but they’re sending me here to get more confidence. 9. In the minor leagues you have posted some prodigious strikeout totals and incredible strikeout to walk ratios. While it is not surprising that your strikeout totals have fallen at the major league level, it is surprising that you have struggled with your control. How would you explain the stark difference in your numbers from one level to the next? CO: The strike zone is a little different. Calls that I might get in the minor leagues I don’t get up there. I think it just goes back to maintaining my aggressive style while in the big leagues and I’ve gotten away from that. 10. How would you describe pitching at the Trop? As a pitcher do you like pitching indoors? Does pitching so many games indoors make it difficult to adjust to games on the road? Would you consider it a hitters’ park or does it play fair? CO: Pitching at the Trop is a little different. I don’t think anyone loves playing inside, but it’s something you get used to. It plays fair. 11. Who is one player on the Durham Bulls roster (pitcher or fielder) that may fly a bit under the prospect radar, but whom you think is on the verge of breaking out and will be a successful big leaguer? CO: Jeff Ridgway. I think he’s got the stuff to be a very good big league pitcher. It’s just being consistent like everybody else. He’s on the verge of breaking out. [Rays Index] We have been following Orvella’s progress for several years now and it is easy to forget that he has only been a pitcher for about five years. Also, looking back, Chad’s dominance at the minor league level may not have been the best scenario for his development. While it gave him confidence to succeed, it may have also provided a false sense of security. It is telling that a young pitcher still learning the craft is just now beginning to use video. That indicates, that up to this most recent struggle, he has relied completely on natural ability, and never learned how to work through adversity. It is also worth noting that Orvella was on the major league roster for over a month and yet he says that he really hasn’t yet had a chance to work with Jim Hickey. We are no experts, but if a guy goes from 12 Ks per 9 innings to 7 and all of the sudden can’t find the strike zone after having impeccable control in the minors, the first thing we would do is dust off some videotape of Orvella from 2005 or 2006 and see if anything had changed. It is amazing that James Shields was the only person that noticed a change in Orvella’s mechanics. Many, us included, have wondered aloud if Chad Orvella is a classic AAAA pitcher, with the ability to dominate the minor leagues, but without the stuff to succeed in the majors. Still, his minor league numbers are too impressive to write off and we need to remember that he is still learning how to pitch, how to succeed and how to handle adversity. If Al Reyes is traded before July 31 as we believe he will be, look for Orvella to emerge as either the Rays’ closer or 8th inning set-up guy in 2008. Interesting interview.Thanks for posting it. Kudos for taking the initiative to get this. It's great to hear about a player from the player himself. I'm a great believer in minor league stats, so I'll always be an Orvella fan. He's gonna make it. PS - Didn't Shields teach some other pitcher a new pitch? Shields for pitching coach! What a great interview! Well done. And I sure learned a lot. Cogent questions and thoughtful answers from a very promising young player.